Dryness of the eyes is a very common ailment. It can range in severity from being an occasional nuisance to being a truly sight-threatening condition. Dry eyes are also known as “sicca” or, when more severe, as “keratoconjunctivitis sicca.” The term “dry eyes” simply means that the tear film that coats the surface of the eye is diminished. Symptoms include “tired” eyes, grittiness, burning or stinging. Surprisingly, intermittent tearing is one of the most common symptoms because reflex tearing occurs to compensate for the dryness. Many factors can aggravate dry eyes. These include getting older, fatigue, environment, visually demanding work, some medications and certain systemic diseases. Usually dry eyes can be diagnosed by an eye examination, using a sophisticated magnifier call a slit lamp biomicroscope. Sometimes additional tests, such as the Schirmer test, or special dyes are used. These measure the amount of tears produced, the composition of the tears or the degree of secondary injury to the surface of the eye. There are many treatments for dry eyes. Treatment of mild dry eyes usually consists of environmental adjustments and occasional use of over-the-counter artificial tear drops. 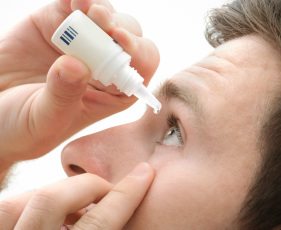 Moderate or severe dry eyes may require prescription eye drops and more frequent use of artificial tears. Patients may also benefit from a simple in-office procedure called punctal occlusion or punctal “plugs”. Punctal plugs are tiny, biocompatible devices inserted into the tear ducts to block the drainage of tears from the eye. This “conserves” the eye's natural tear film and surface moisture to relieve dry eyes. These devices are smaller than a grain of rice. Punctal plugs usually are considered when non-prescription or prescription eye drops fail to relieve your dry eye condition. Dr. Hogue and Dr. Gourley have a wealth of experience in treating this condition and will recommend the appropriate treatment after an examination.